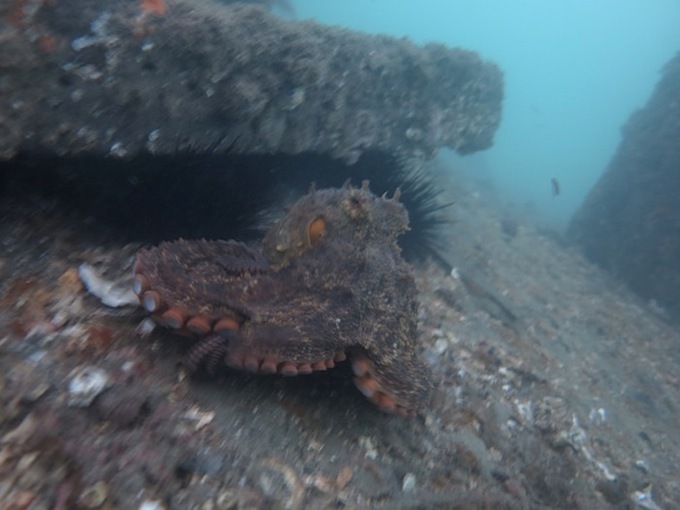 A couple of weeks ago while diving I found a large octopus underneath a jetty at Chowder Bay in Sydney Harbour. To get a good look at him, I had to come right under the jetty into the dark. He sat calmly, mostly out of his den, facing away from the sea. I watched the octopus, and he watched me. Then the octopus moved – not back into his den but sideways, pretty quickly. I looked up and saw a huge shape coming towards us from the sea side. It was a stingray, gliding in like a monumental, soft-bodied UFO. I don’t know how big it really was, but it looked, in that context, about the size of a small car. It was probably a Smooth Stingray or a Black Stingray. The ray was soon under the jetty, and there were, for a moment, too many bodies in the small space. 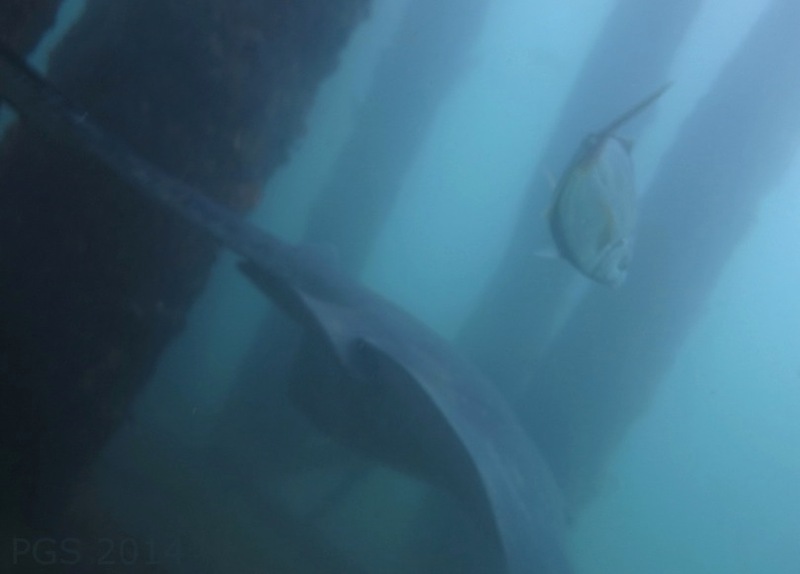 But the ray kept transmitting itself through and I edged over to the side (the other side from the octopus). The tail came by and I saw the barb, looking like a large chef’s knife. Then the ray was gone, out the other side of the jetty. 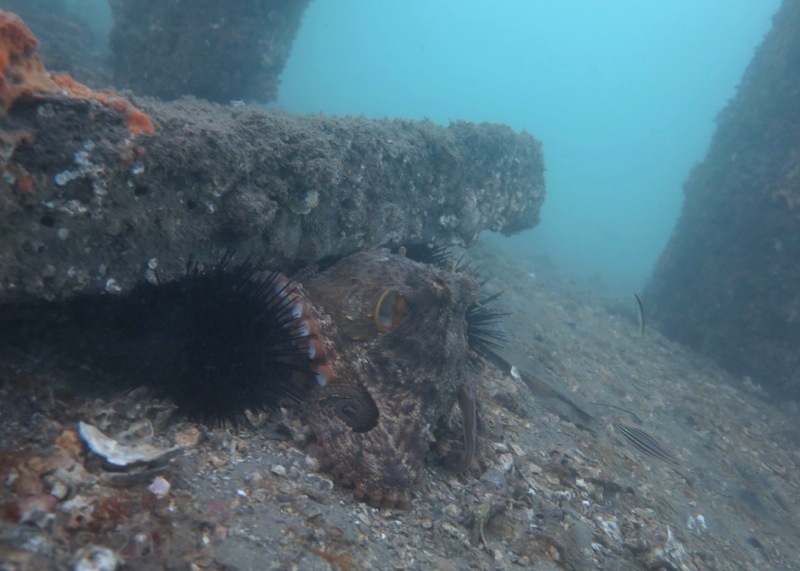 The octopus was sitting among some urchins on the far side of the submerged beam where I’d found it. I came out of the corner I’d retreated into, and the octopus scampered back along to its den. The octopus’ behavior was interesting for a couple of reasons. First, I was surprised how quickly the octopus saw the incoming ray. The top photo of the ray above was taken a second or two after the octopus had begun to move, so the ray was a fair way further off when the movement started. 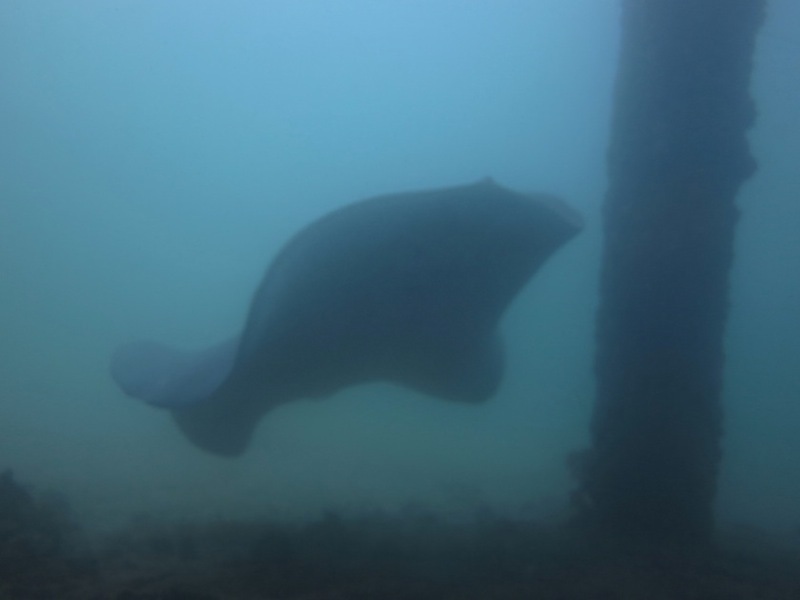 The ray was also almost directly behind the octopus’ head, coming in from the sea while the octopus faced forward into the gloom. Second, the octopus didn’t react by pulling itself under the hard beam or slab that provided a roof to its den – which I’d have thought would be quite safe – but went into the open, moving along to a spot away from the direct path of the ray. I’ve never seen an octopus take evasive action in this way before. Usually they vanish in to whatever is around them. Rays, including the smooth stingray, have electrical sensing organs, the beautifully named Ampullae of Lorenzini. They can detect small animals hiding in the sand by eavesdropping on the electrical activity in their brains and muscles. Some other kinds of rays, such as the numbfish, can produce strong electric fields, for stunning prey and/or defense. For a moment I wondered about some sort of electrical basis for the octopus’s early detection of the ray – the octopus detecting a field produced by the ray – but I’ve not found any evidence for this, on either the octopus side or smooth stingray side. I suppose octopuses just have very wide visual fields, and take giant incoming rays seriously. This entry was posted in Nervous Systems, Octopus, Vertebrates. Bookmark the permalink. is “scampered back” supposed to link to a video? [No, just the blurry still: PGS] At some point recently, I discovered you have a whole YOUTUBE channel and resolved to watch it instead of old Colbert Reports tonight! hopefully I will find it there. I agree with Denise that the thing I can’t get over is the unexpectedness of the octopus’ escape strategy. There is something interesting going on here where sensation and “emittance” is concerned. Either on the part of the octopus, the stingray, or probably both in concert. Denise is onto something potentially really cool here with the “learning through observation from heterospecifics.” Based on my following of the wolf vs dog cognition literature — one intriguing hypothesis is that dogs may learn from “eavesdropping” on human-human interactions as well as through direct human-dog interactions — whereas wolves may not be such good communicative “eavesdroppers.” I wonder if octopi, due to their mostly solitary nature, are generally very good at learning through observation of heterospecifics (ie, who does/doesn’t get eaten and why). But I STILL don’t get how the octopus’ field of view is so large and/or sensitive. I’m guessing you’ve seen a lot of these guys and have firm basis for determining that this octo was an outlier? Is there any scientific literature on retinal ganglion cell distribution across the octo-retina? Or whether they may have sensors that are NOT just tactile on their arms? Some means of arm-based sensation that is capable of sensing at long distance (e.g., electrical, some kind of water-dispersed chemicals, vibrations in the water — though I guess that would fall under the category of tactile, but just super sensitive!)? I don’t know if he’s an outlier. I’m often surprised at how much cephalopods see. Giant Cuttelfish seem to see other Giant Cuttlefish in the water well before I can see them, for example. They definitely have chemical sensors in their suckers. They taste everything they touch. The possibility that’s more remarkable here – which I’d not thought about in connection with this case before your comment – is visual sensitivity in the octopus’ skin. There’s an intriguing literature about the fact that cuttlefish have photopigment genes expressed in their skin. I write about it a bit here. And there’s an abstract for a paper by Desmond Ramirez I found a year or so back, here . It’s just an abstract – still not a paper. That one’s an octopus study, not a cuttlefish, which the earlier studies were about. As I say, it had not crossed my mind before, but it does seem conceivable that a dramatic change in light from behind could be registered by a skin-based photoreceptor system. On the other hand, a change in illumination of that magnitude would probably have effects round the front of the animal, also, where the eyes could pick it up. I am going to check in with Ramirez about this. I wonder if the octopus avoided its den because it would not be able to escape the ray if it detected and decided to eat the octopus. I have seen images of the rays ferreting out food from the sand (not sure of species though) and it does not appear the supper had a chance along the sea floor. Being in the open might provide a better getaway opportunity with vertical movement. Assuming that thought has merit, the question becomes, how would the octopus “know” this was the safer positioning. I have often thought that octopuses may learn from observation of other species rather than conspecifics (since observing their own kind can be lethal). I’ve seen it with a dragonette and a seahorse living together in an aquarium and would not be surprised if other species observation is common for many animals.. 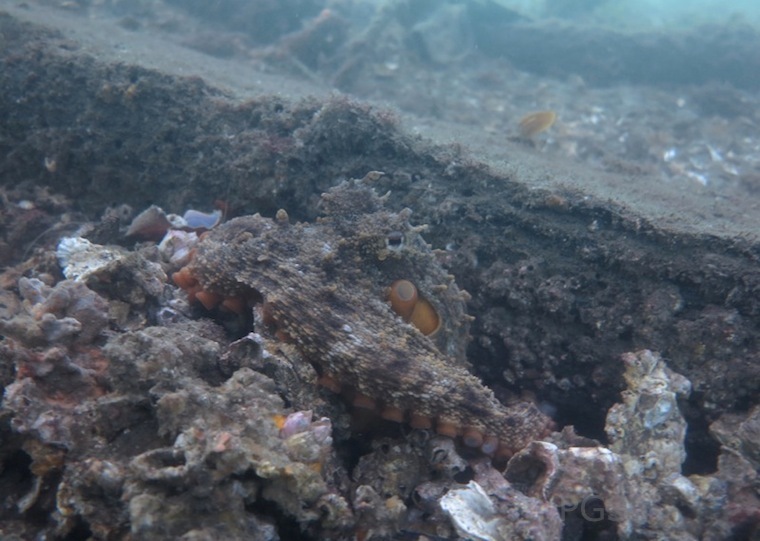 I remember that the only other time I’ve seen an octopus of this species take cover as a large stingray came in, it did so by withdrawing into its den, not going into the open. So that suggests that the behaviors seen here aren’t fixed and reflexive responses to a looming ray. Here is a video of that other incident, which was at Octopolis. Learning by observation is a controversial phenomenon in lots of species, including octopuses. There’s a paper by Fiorito and Scotto, from 1992, which seemed to show observational learning by one octopus watching another. The finding has not been replicated, as far as I know; in the literature it’s very much a one-off case. (That does not mean I don’t believe it.) I’d be interested to hear about your seahorse case. Could you describe it?